We're Moving- to 963 Cherry St SE! We’re moving to 963 Cherry St SE! We are so dang excited about this move and all that it means for our business! One, we are beyond thrilled to be joining the East Hills Neighborhood! Our new space is located at 963 Cherry St SE, in between Under the Vine Wines and the Cherie Inn. Cherry Street in East Hills is a vibrant shopping and dining district that has been a crossroads in our city for the last century, connecting downtown Grand Rapids to Eastown and East GR. It’s home to some really fantastic businesses and restaurants too- the legendary Marie Catribs (RIP, the best vegetarian fare in the world), the 80+ years old Cherie Inn, YT Galleria, the Metal Arts Studio, Brewery Vivant, Marie La Mode, Denym, and the Green Well, just to name a handful! The neighborhood is perfect, but believe it or not, the space itself is even freaking better! We worked with a wonderful local broker, Joe Rizqallah of Signature Associates, to secure the space, and he was pretty darn rad- he listened to our needs carefully, and through the web of connections that is GR, found us just the right spot! At approximately 2400 square feet, this spot is going to be a space where our business can grow for years to come. Originally built as a gas station in 1936 after the historic Biltmore Theatre was torn down, it has frontage on both Cherry Street and Lake Drive- we learned from neighbors that there were gas pumps on both sides of the building at one point! It has since been added onto, and given that there are multiple rooms for the space, it was a tough one to rent until we came along. For us, it’s perfect- we have 740 Square Feet of dedicated retail space on the Cherry St side, as we as a large main workspace, an office/kitchen, and a dedicated sewing gallery on the Lake Drive side. All that said, the space needed a lot of work- there was a fire in it earlier this year due to a maintenance accident, but it turned out to be a blessing in disguise. Old drywall, non-loading bearing walls that cut up the space, and bad industrial carpet that were all damaged in the fire revealed amazing details, which we’ll be sharing in our next blog post! But here, a sneak peak of what’s to come! the original tile wall and window of the gas station when it was built in 1936, before the front room addition, with handpainted murals from its next iteration as a fish-fry place! 11/20/18- Soft ReOpening! Start dropping on in and be ahead of the curve! 11/24/18- Small Business Saturday! We’ll have doorprizes for the first 20 shoppers through the door, snacks, and our Keychain Stamping Station up and running! 12/6/18- the Uptown Holiday Shop Hop! It’s the most wonderful time of the year when Uptown pulls out all the stops- and we can’t wait to be part of the biggest shopping party in town! Plus, we’ll have Adventure Textiles popping up with us so you can get your fill of naturally dyed, handwoven awesomeness. 12/8/18- Our GRAND REOPENING PARTY!!! We’re gonna eat, drink, and be so dang merry y’all. It’s time to celebrate this new space and all it’s glory, with handmade holiday cheer. 12/15/18- DIY Drop-In Holiday Craft + Gift Day Come get your holiday craft on with us, elementary school style! Drop-in to create simple leather-goods, gifts, and ornaments that will make perfect gifts for family and friends. Prices range $10-$20 per craft project! 12/22/18- Last Minute Pop-Up Shop w/ Conscious Clothing! If you’ve procrastinated all the way ‘til now and think it’s too late to shop local, think again yo! Come shop ready-to-purchase goods from the extensive Conscious Clothing collection of clothing and accessories, all hand-sewn and hand-dyed right in Rockford MI! We’re so grateful for all of you, our fans, friends, family, and makers, that have stuck it out with us for the long haul down here on South Division. When we started this experiment that was Parliament and now is Gemini Handmade, we had no idea where it would take us- we just knew we wanted to have shop selling handcrafted ethical goods from makers we love and admire, built a thing, and hoped that the humans would come! And boy, have you ever- we can’t express enough gratitude for everyone that has believed in us and helped us make this handmade adventure a true, lifelong reality! Stay Tuned for our next blog post about the history and renovations to our awesome new location, and all that we’ve learned about this beautiful neighborhood we’re proud to be calling our new home! Below is a sneak peak- the original building when it was built in 1936! And in the words of our mother, Barbara Vroon: THE BEST IS ALWAYS YET TO COME!!! 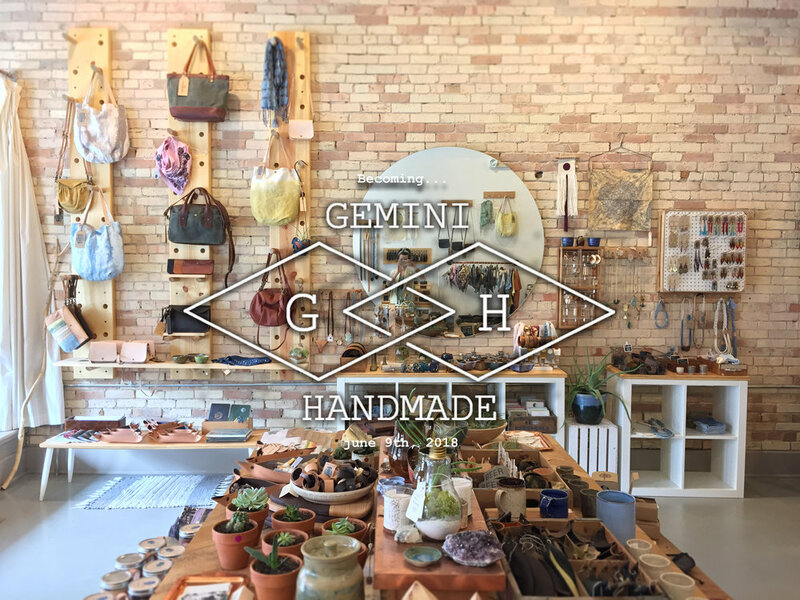 Gemini Handmade: Our new Wholesale + Gift Offerings! Wow-wow! Say hello to our new offerings menu for the shop, which was all hand-lettered by me, by-the-way- we’re really stoked about how all the new branding is really coming together. We’re also beyond stoked to share all our new services and offerings. We’ve been promising to get you in the loop about all our new private label, wholesale, and gift offerings at the new Gemini Handmade, but what does that all mean anyway? What is private label? Custom? Gift offerings? Read on to learn more about what these terms really mean, and how they can apply to you! 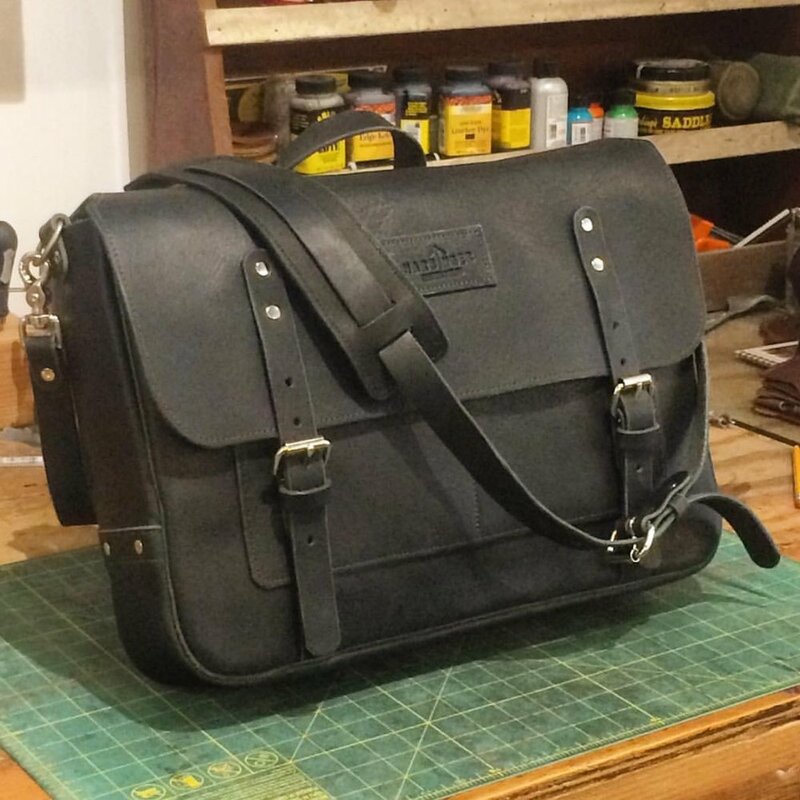 A custom Harbinger Leather Design messenger bag for an individual client. Custom Goods: This one is obvious! Have a cell-phone that needs a specific sized case, perhaps you’re a chef that wants a custom knife-roll for your knives, or you just have this idea for the perfect bag stuck in your head? Any of those are custom orders, and we’re happy to consider them! Email us for a free custom consultation, and we’ll set up a meeting where we can discuss your dream and figure out a way to make it real! Monogramming: This one explains itself too. 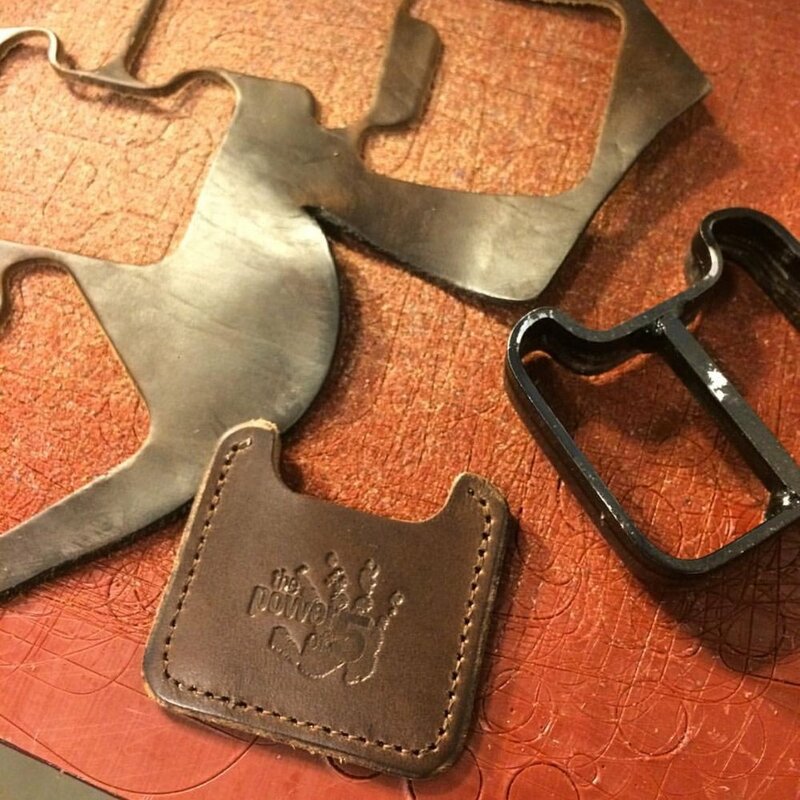 We offer stamped and hand-lettered monogramming on most of our leather products. Purchases from us include a basic, 3-letter monogram for free with purchase. Have something of your own you’d like monogrammed? Cost starts at $5! 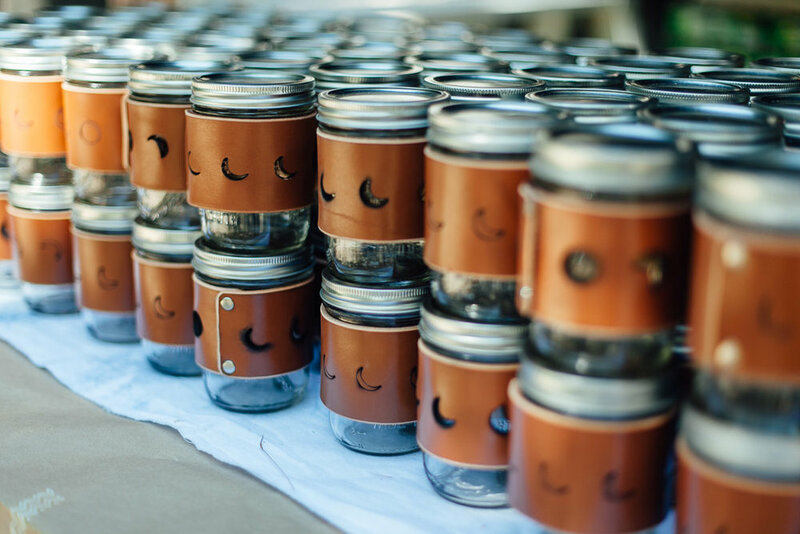 Wedding favors from Jake and Elyse's Camp Blue Moon wedding in 2015. Weddings Gifts: Because we craft in small batches, we often get asked to create little runs of products for bridal and groom parties. This might be wallets or cuffs for the groomsmen, or all matching earrings or sandals for bridesmaids. We also have created larger batches of favors in the past, such as a mug-wrap for each guest at our own Camp Blue Moon Wedding. Either-way, we are amped to make something handmade for your big day! Custom designed and stamped challenge coin cases for a local corporate initiative. Corporate Gifts: Ya know that bag of swag you get from the office at the holidays, or that fine portfolio that was a free gift from your new financial advisor? Companies get that swag from somewhere, and we’d like more of them to get it from us! We’ve created corporate batches of product of 100+ units for law-offices, accounting firms, and real-estate agencies, incorporating single letter monograms for the individuals receiving the gifts- and, we can even create a custom heated stamped of your business’s logo, making an unforgettable connection between the gift and your organization! Event Favors + Promotional Items: You’ve all received a chatzky at some point I’m sure- those little coasters from the bar, or the nylon back-pack you got when you signed up for your gym membership? All those weird little things are considered event favors and promotional items. We’re proud to offer high-quality leather and canvas options for favors for your upcoming event or launch, ranging from key-chains with your logo custom embossed, to merchandise for your brewery’s company store! The new Wave fold-over messenger tote from Woosah Outfitters, built by Jake at Gemini Handmade. Private Label: This is the term that hangs a lot of people up- what the heck is private label? Does that mean the tag is invisible? No, private label simply means that we make stuff for other brands. A great and cherished example for our shop is our ongoing relationship with Woosah Outfitters here in Grand Rapids. We design and make all the canvas + leather goods in their shop, such as custom bags with their own fabric designs, mug-wraps that feature Woosah’s wood-cut logos, and even the engraved leather-patches for hats and apparel! If you have a lifestyle, home, or entertainment brand that is seeking merchandise to expand your offerings, we would love to help you design and make it, and will work with you to create a line of goods that meet your price, aesthetic, and will be a win for all involved! Littlewings Designs catch-alls, available for wholesale order. Wholesale: Wait, so I can walk into your store and if I buy a ridiculous amount of wallets, get them at a wholesale price, like Costco? Well, sort of. Each of our own fashion lines, Littlewings Designs and Harbinger Leather Design, as well as the Gemini Handmade line of gift-goods, are available for wholesale purchase by gift-shops, boutiques, and stores. These products are labeled with the brand from which they are ordered (Harbinger Leather Design, Littlewings Designs, or Gemini Handmade), and are meant for resale by a licensed shop entity. Do you own a shop of handmade goods, curate a museum gift-shop, or merchandise for a chain of stores, and want to add handmade leather-goods? Then our trio of brands may be perfect for you- please get in touch for wholesale ordering information from any of our brands! Consulting: Sometimes, you have an idea or own a business yourself, and you’ve run into a jam. Perhaps you’re a cut and sew manufacturer that needs a construction technique reworked for a bag, or maybe you’re an entrepreneur looking to create a new product and need advice about where to start. We are happy to offer consulting in design, leather/soft-goods production, and handmade business operation, to other businesses and clients- get in touch with us about hourly rates and session packages! Yes, we've been asked about making a leather hot-air ballon; no, we did not take on that commission. Prototyping: Do you have an idea for a whole product that’s never been seen before and is going to change the world, and it’s made out of leather? Let us help you make it a reality! We get so excited to help entrepreneurs bring their ideas to life for custom leather-goods, ranging from bags and tool-belts to home fixtures and decor. We’ll meet with you for a custom consultation about your project, learn about your needs and goals for this idea, and work with you to manifest the dream in your head into an object in your hand. The sky is the actual limit, though we do have to draw the line at hot-air balloons. Keep your eyes peeled here as we begin the big rebrand with our launch party this weekend, Saturday June 9th from 12-7pm, where we will unveil the new shop look, the new website, and show off a new collection of our Gemini Handmade catalog of goods, and send us an email to request our wholesale line-sheet and other ordering information! It's official: we're rebranding here at Parliament! 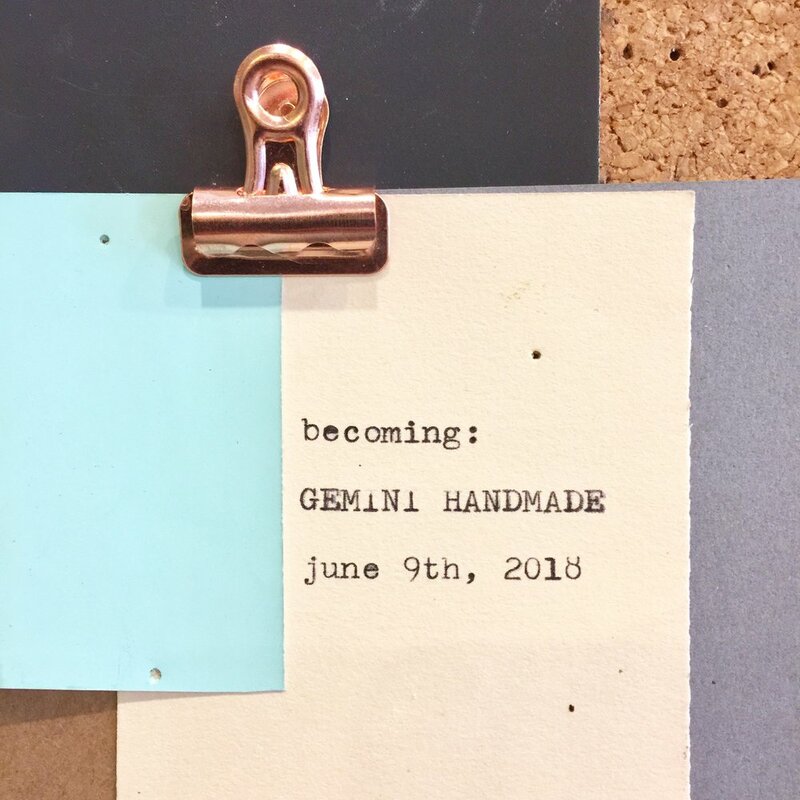 On June 9th, 2018, we will be known as Gemini Handmade! We're really excited about this shift and all the ways we will be pushing for new growth and direction with this new name. Originally, Parliament was launched by me, Elyse Marie Welcher, as a storefront and studio for my brand of leathergoods and accessories, Littlewings Designs. I knew I wanted to carry the work of other artists and makers, so a different name was necessary; since my logo is an owl and a flock of owls is called a "Parliament" it seemed like a fitting name for the shop. But since launching, the scope of the shop, what we do, and why it exists have all evolved dramatically. We went through a season of collective ownership, when my husband and another partner joined the business, and have shifted out of that collective ownership recently to be owned just myself and my husband Jake. We also have shifted our literal location to a new home at 136 S Division Ave, taking up residence in the space we love in February of 2017. We have evolved in what our shop offers and produces- we started out as more of an atelier and boutique, and have evolved far more into a studio and gift shop. Finally, Jake and I are now running the shop side-by-side, with Jake having a far greater role as the production manager of all our wholesale and gift production, while I have evolved into the creative and marketing director of our three brands together. The original naming and all of these other shifts have led us to realize it's time for the next chapter. Jake and I have been waiting for the chance to bring the story back to center about our journey as a couple of leather-workers, and with a new name and new scope, we're thrilled to be able to do that! Gemini Handmade is a play on mine and Jake's birth story. We were born 2 days apart in Grand Rapids, MI, at the same hospital, and were in the nursery at the same time. We realized this on our second or third date, and it was pretty obvious to us that we were meant for each other- the very stars had written it to be so! So, in having the chance to rename our space, we wanted to make it about the two of us, and our complimentary roles in the business to one another- and we're both Geminis, so how could we not? We're really excited about what all of this means, and can't wait to celebrate with you, our friends and fans of all these years! well into a new decade for the big 3-O! Stay tuned here for our next post, where we will share more about our new offerings for wedding, event, and corporate gifts! Seeking Summer 2017 Social Media Intern! Have you ever wanted to learn how to run social media for a modern handcrafted business? Have you ever wanted to get an inside look at how handcrafted shops and studios are run? Do you have a dream of getting involved with fashion, but aren't sure how to do that here in West Michigan? Then you might make for a great Parliament Summer Social Media Intern!!! We're seeking a 1-2 day a week intern that is snappy with a camera, has rad style, and can bring the hype both in-type and in-real-life to assist with our social media this summer. Candidates should have a swoon-worthy IG feed, and be able to charm, sass, and word-craft with the best of digital divas. This individual will report to Elyse, the creative and marketing manager for Parliament. Interns may also need to be available for other weekend and evening hours for special events. include links to your current social media handles: IG, FB, + Twitter. Bonus if you have blogging or Pinterest experience! A short writing sample- this could be a blog post, a critique you wrote, or an article. Be creative! A few photos showing your Photo styling skills- Parliament is known for its distinct style and eye! Finally, stop in for a visit or during one of our events, and introduce yourself! There is nothing better than a face-to-face meeting to make a best impression. We're seeking to fill this position within the month, so get your fingers typing and spread your wings, babes- I'll be keeping my eyes on the inbox! Me Made May 2017 at Parliament! 5/5: May First Friday Pop-Up Shop w/ Conscious Clothing, 5-9PM- Join us for a pop-up with local sustainable fashion brand Conscious Clothing from Rockford, MI. Eco-conscious and timeless designs for you and your littles, all handcrafted in their woodland studio. 5/7: Sashiko Patch Workshop w/ Littlewings Designs, 3-6PM- Learn to patch your own clothes with Elyse of Littlewings Designs, utilizing the Sashiko method. Participants will learn to patch pants, shirts, and other clothes with this sturdy Japanese embroidery style. 5/13: Make Your Own Flip-Flops w/ Littlewings Designs, 10AM-1PM- Learn to trace your feet and create your own pair of all leather flip-flops with Elyse of Littlewings Designs. Participants will leave with a completed pair of all leather flip-flops! 5/19: Make Your Own Crop-Top w/ Littlewings Designs, 5:30PM-8:30PM- Learn to draft and sew your own crop-top shirt with Elyse of Littlewings Designs. Participants will bring a comfy structured button up or other cotton shirt from their own wardrobe and learn to use this as a basis to create another garment, and will leave with a completed crop-top shirt. Ongoing Thursdays + Saturdays (see our website for time-slots): Make Your Own Rag-Rug w/ Adventure Textiles- Learn to weave your own rag-rug on a floor loom with Megan of Adventure Textiles! In single or double class sessions, participants will have one-on-one instruction and learn to weave their own rug using recycled fabric; each participant will leave with a finished rug! What is Me Made May? Me Made May was started in 2010 by Zoe of the Blog "So Zo, What do Ya Know? ", a sewing blog dedicated to Zoe's process of making clothing for herself and her family. She shares patterns, tricks, tutorials, and in 2010 started Me Made May as a challenge to herself to wear something she had created everyday of the month! She wrote about her goal on her blog, and the idea was met with great enthusiasm from the DIY and Sewing communities; fast forward to 2017, and it is now a Instagram phenomenon and network of its own, connecting rad folks across the globe who make their own clothes during the month of May using the hashtags #memademay and #mmmay17. 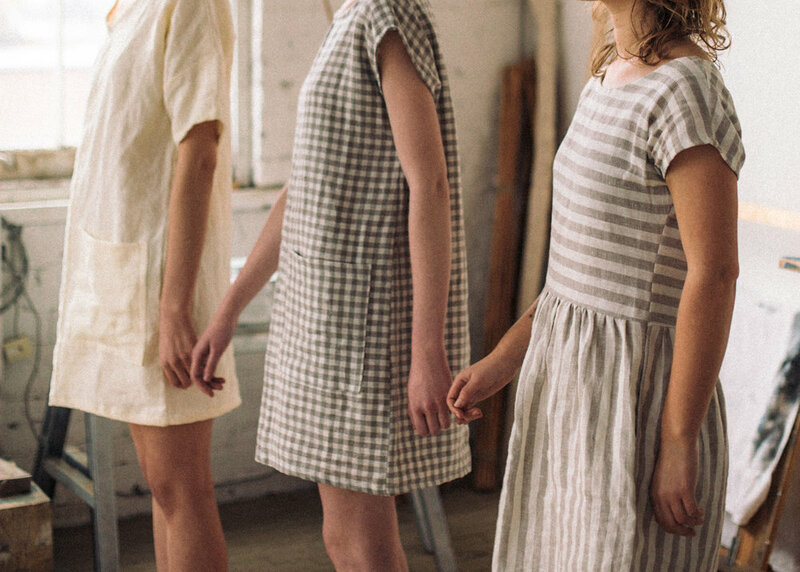 It has also evolved and grown to include considerations about slow-fashion, who makes your clothes and just how much time goes into them, sustainable living through a handmade wardrobe, and the impact of choosing to buy locally handmade goods from others. For us at Parliament, making our own wardrobe is one of the side-passions amongst all of us makers. Both Elyse and Megan got their start with handcrafted in sewing clothes for themselves, and have been long-time users of open-source patterns such as BurdaStyle.com, have been drafting patterns for their own clothes for many years, and regularly make their own clothes still, for fun! Plus, they both have professional experience: Elyse minored in Fashion with her Accessory Design BFA from SCAD, and Megan works as a professional seamstress for local makers Conscious Clothing, an organic clothing company who we're proud to be hosting for First Friday in May to kick off our month of programming! Thus, we knew that in this new space where hosting workshops was such a blast, that we wanted to bring together a series of programming in honor of this fun month, and celebrating the handcrafted wardrobe. We, Team Parliament @parliamenttheboutique, sign up as a participant of Me-Made-May '17. We endeavor to create a space of support and community around achieving handmade wardrobe goals through workshops and events, for the duration of Me-Made-May '17. We also pledge to share our journey and adventures along the way! You can make your own pledge using the following format, and comment below to share with us! We are thrilled be able to support our creative community this Me-Made-May, and hope you will join us at the shop for a workshop or two! Sign-up for classes on our website here, or stop into the shop in person to reserve seats! Here's to Me-Made-May '17! See you at the shop! Wondering what that “D.I.Y Series” thing is that Parliament is hosting? Well, let us explain! We have decided to add some do-it-yourself events to our schedule to allow for more community members to get involved with something creative. We understand workshops are not for everyone, and they can be slightly more pricey, and we do not want that to stop you from enjoying the process and getting creative with us. So, for our D.I.Y. series, we are having three different projects available throughout the weekend of March 17th. Friday will consist of dyeing your own garments in natural dyes with Megan Roach of Adventure Textiles. You can pay $5 per garment, or $10 for 3 pieces, to naturally dye them in our beautiful dye baths. Saturday will be for creating a pouch necklace with Elyse of Littlewings Designs. These little necklaces are unique and fun to make. If you are interested in jewelry or just one-of-kind items, this D.I.Y project is for you. Sunday we will be offering a D.I.Y. monogrammed key fob, which you will make with Jake of Harbinger Leather. For more information on this series and the different projects, check out the shop tab. This is a unique event that allows you to get involved with natural dyes and interact with Team Parliament. So, stop by on one of these days during our store hours and get creative with us! Interested in hosting a workshop at Parliament or vending your handcrafted goodies in our space? Well, you now have that opportunity! You can apply to either of these positions under the Vend + Teach tab above. To apply for either a pop-up shop or hosting a workshop click on the Vend + Teach tab. Under this tab you will find two separate forms, the one on the left is where you apply for hosting a pop-up shop and the one on the right is where to apply to teach a workshop. After you apply, we will get back to you in roughly ten to twelve business days. For further questions, please send us an email! To register to take our Greenery: Natural Dye Workshop, and future workshops, you can go into the Shop tab above and find the product block with your desired workshop. Right now, we are able to purchase your spot in on our workshop on March 11th. Reserve your spot now, tickets are limited! If our workshops do not appeal to you, possibly our new DIY Series could be better fitting. This new series will allow you to stop in on the given night and engage in Do-It-Yourself projects with Team Parliament. For the first DIY Project, you can bring in your own garments to dye. To check out pricing on each garment, check out the second block under the Shop tab that is called DIY Series: Dye Your Garment. You must bring your own items and we will provide the rest. The DIY Series allows everyone to give natural dyes a try, whereas our workshops are more for educating. If you are highly interested in natural dyeing fabrics and garments, this may be the class for you; but if you would prefer an express version of this, you can stop by for the DIY Series. Think of the Workshop as a full class and the DIY Series as a self-guided session! We have lots of exciting events coming up, so be sure to explore our website more and stop into our space for any questions. We hope to see you at some of our upcoming events! Thank you to everyone who came out to our Grand ReOpening on Friday the 3rd. It was such a wonderful turnout and we were so thrilled to have so many friends, family and community members at the event supporting us. The Grand Rapids community has been very supportive throughout this whole process, and we are so honored to be apart of such a colorful arts community. We look forward to making many more connections with our local community. For more information on our upcoming adventures, check out our Workshops + Events page. You can also find out information on hosting a workshop or vending your goods at Parliament under the Vend + Teach page- stay tuned for info next week on how to sign up for our first workshops, coming up in March, Natural Dyeing and a terrarium building workshop! We’ve moved!—Parliament the Boutique has moved to a new space, and it is only a couple doors down from our original space. Over the past couple of years Parliament has been growing continuously, starting as a small studio + shop, growing into two spaces, and now coming back together again under one roof. We entered 2016 abrim with the possibilities, but not sure of what was next. A new store? A different studio? We greatly felt the need to streamline and simplify, but were uncertain to do so. When a space we only dreamed of having opened up, on the Avenue for the Arts and within our community, we knew we had found the opportunity. In August, we made the choice to move both store and studio back under one roof, like the original Parliament, but way bigger and better than ever before! We knew it would be a long road and transition over the next 6 months and into the New Year, but we also knew it would be oh-so worth it. We want the new Parliament to mean something more, going beyond the products sold, we want to connect with the community of Division Street and the greater Grand Rapids area. We want to bring the craft and artistic aspects of our goods to life; every customer will now be able to understand how the finished products they purchase go from raw materials to works of art. Our old space was challenging in this regard; our audience could only shop the product, and everything was made off-site in a different space. Our bright new space will offer a comfortable environment for our visitors to both shop and learn, all under one cozy roof. If seeing is not believing for you, why not take a step closer? We will be introducing community workshops starting in March; workshops will be taught by Parliament founders and other community makers + artisans, and you will have the chance to create under a teacher’s instruction, within our space. We are so thrilled to add this aspect to our business, and are excited to bring the participatory experience of creating an object full circle, for our audience. Throughout the year there will be a number of different workshops for the community to participate in, including basic leathercraft, natural dyeing, and a DIY clothing series in May- we are so excited! Our goal for the new year, and new space, is to make Parliament a cultural destination. We want people from near and far to be curious as to what we are, not just what we can sell. We want them to experience the magic that goes into our craft. We are no longer just a place to buy hand-crafted and unique products, but a place that the community can come together and explore the process of crafting the beautiful objects that fill our daily lives. We are looking forward to what 2017 has in store for Parliament, and are excited to welcome you to join us in this journey. Parliament has always been a crossroads for makers and their community; we are blessed to continue being that place, and look forward to all the new ways to deepen this space for everyone’s enjoyment. We want to thank the community for the endless support and we are excited to share our new home with you! We hope to see you are our Grand Reopening on February 3rd, 2017 at 5pm. You can find more information on this event on our Facebook page. News on top of news- Parliament is going for 5x5 Funding, and we need your help! Click here to vote login via Facebook and vote for our new space to pitch for $5000 this month! The Great Parliament Shift: Our New Space! Parliament is moving to a glorious new studio + storefront under one roof, at 136 S Division Ave! Get all the details here on the blog!